Activities - portsmouthgardenclubs jimdo page! 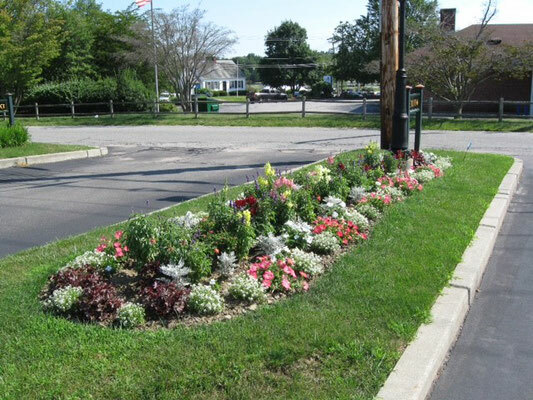 The Portsmouth Garden Club is very active and involved with many ongoing events in the area of civic beautification for the Town of Portsmouth. 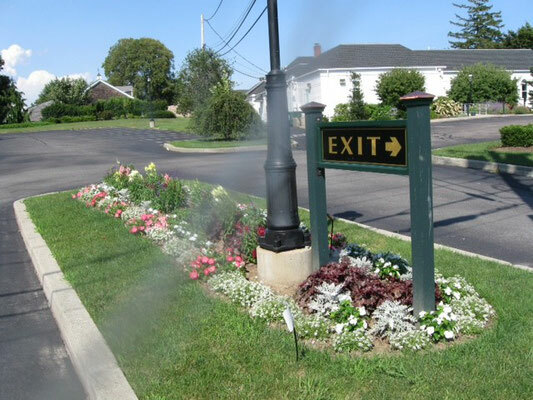 We have landscaped many of the Town Building properties that include the Town Hall, Legion Park, the Water and Fire District building, and the Portsmouth Free Public Library. Under the guidance of the Civic Beautification Committee, landscaped with Martin Van Hof, the new entrance of the Library from the parking lot and the island main entrance. Civic Beautification continues to plant and maintain this island. We also decorate the town buildings and Legion Park, during the month of December, with holiday-embellished wreaths. See schedule. 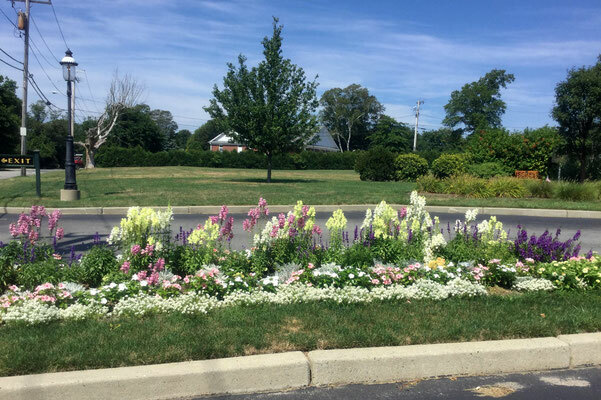 We have incorporated the concepts of Garden Therapy with our involvement with the students at Portsmouth High School (See School Involvement) and holding our annual flower show at Atria Aquidneck Place, the Assisted Living Facility in the town of Portsmouth. We have held, in the past, flower arrangement workshops with the residents and continue to hold our annual flower show at Atria Aquidneck Place to provide a beautiful floral setting for the residents to enjoy and as it is scored by popular vote, the residents have an opportunity to participate in this activity. 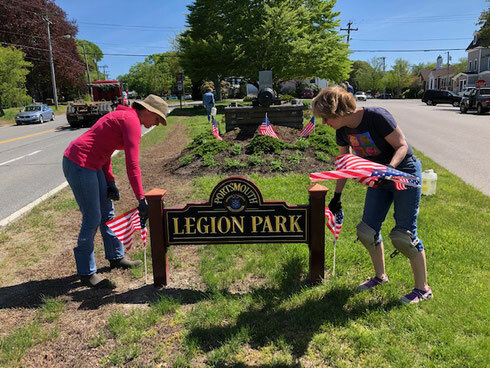 The Portsmouth Garden Club's Civic Beautification program will receive the benefits of the plant sale to be held May 22 at the Island Garden Shop. 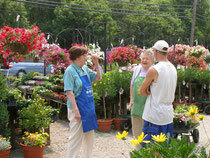 This will be a percentage sale of items at the shop at Cozy Corner with Mrs. Hoyt Rountree as chairman. Members of the club who will serve as saleswomen will meet with Mrs. Rountree on Thursday. This was announced at the meeting of the executive board Wednesday at the home of Mrs. Winsor Warwick, Bristol Ferry Road." We have worked on this project over the past 43 years and the club fully participates on the second to the last Thursday in May and continues to serve as saleswomen. We cherish the generousity and support shown to our club by the Van Hof family for our Civic Beautification projects that have been accomplished during that time. Our club participates in workshops throughout the year donating the results of the workshops to local organizations. An example of this is demonstrated by the annual Valentine Workshop where the club creates floral arrangements that are placed on the tables at the Portsmouth Multi-Purpose Senior Center for their Valentine dinner/dance. We also create floral arrangements that are donated to the Portsmouth Free Public Library for their annual fundraiser, "A Taste of Portsmouth", during October. 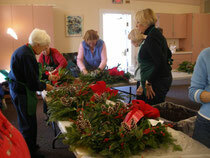 In December, our club's Civic Beautification annual workshop creates decorations for the Town Buildings! See schedule. We invite you to view our activities by clicking on the choices from the left-hand bar.